About A beautiful, strange land formation, North West of Toronto. 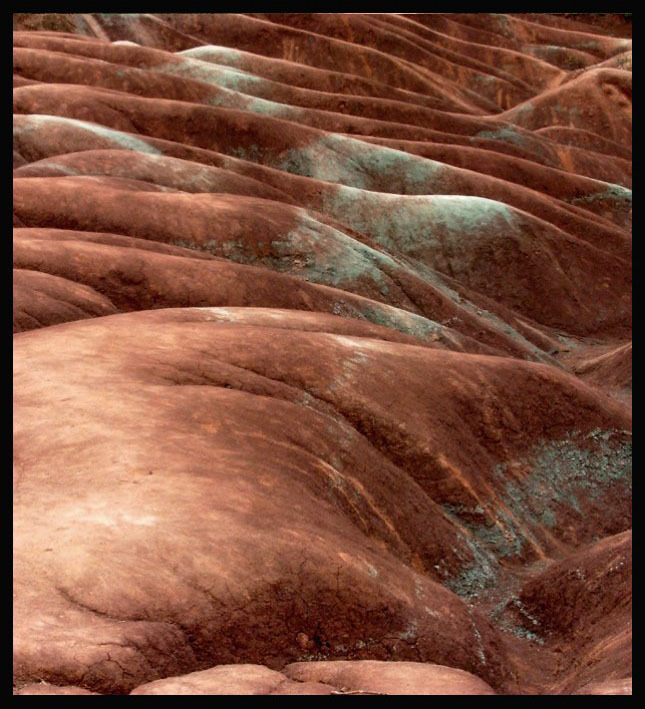 For more great images of the Cheltenham Badlands please visit Tap Ioka's portfolio. I finally made it out there Tap. Thanks to the Staff for the BIP Award! I'll have to go back there one day for some more shots. It is an interesting area. Fantastic Andre..great angle and colors , congrats. I didn't even know this place existed until I saw another Usfilm photographer's picture of the same area. Tap Ioka. The place is only about an hours drive from where I live, yet I had never been there till this year. Wow Andre! How did I miss this one?! This is awesome! Excellent patterns and tones - lovely colours! Well done! gret details. marvelous tones. wonderful composition. I'm almost thinking even a bit more of the vegetation would have worked okay too. I did a B&W version of this one too and the vegetation doesn't seem to have as much of an influence on the image. I like it that way too. Nice one, Andre! I think the vegetation give it some scale and depth. I live only about 80k from this area and I didn't even know it was there until I saw Tap's images. Well, Andre, not only the center of a circle should be considered but also its periphery. But you are right, let's return to the main subject again. On to new images, that is. This is absolutely amazing and incredible my dear Andre !!! We are a little off subject here Nick. But I agree with you, simply based on how many times I've seen older images here that I can't help saying "that is perfect for that project"
Still, I also don't get the purpose of the discouragement. It would be perfectly "valid" to me to repost an image, and it could also help to raise the degree of interaction between UF and its users. Yes, we only have small areas like this here in Southern Ontario. This is actually an ancient lake bed I believe. We do have much larger Badlands in Alberta, about 100 miles east of Calgary. The area near Drumheller is famous for it's dinosaur finds. I think too, that such an image would fit in the project "Patterns in Nature" very well too. Sometimes it can get hard though to decide about the best fitting project, since such images have more tha one identities and even a small hint in some perticular dorection may be enough to alter our own perspective as you say. Just a bit of a different crop and thoughts go some other direction. A very enriching process for the own perception too. And even if we can't decide about some exactly fitting project then that might suggest that the image fits some other project that doesn't exist yet here in UF. Very cool perspective, catching all the "waves". Amazing that you have this type of terrain in Canada, too. Yet yours is mixed with vegetation, unlike here. You had some great light, showing the shadows which emphasize the "roll". We went there last week under the threat of rain. So, I had to hurry the images a little. As you know this stuff can get slippery when wet. It really is an amazing area. The rain let up so we were able to walk about half of the trail (near the old quarry). The biggest problem with taking images near these Badlands is the amount of people around on a nice day. So, maybe I was lucky with the threat of rain. Thanks very much for the nice, detailed comment on this one Shyamal. I did try the shots of this area with and without the vegetation. I think I liked the effect of this one better. Andre! I am very flattered by the inclusion in your "about". I do really appreciate that you finally made it to the badlands and you took some pictures. This particular one is of great quality. I know you can take hundreds of pictures of this place but as a photographer you always want it to look great in your individual way, and you managed that. If I`m not wrong this is the south/west part of badlands which always is giving me a problem. I`m never sure how I should to compose it. Anyway. I`m very happy you were there. Regards. Stunning capture, Andre. What I love most is the shadow play all along the image, these lines that are hacking the picture from top right to lower left, just hacking away and hacking away until the top. In that sense, there is a lot of activity here, and I can even go one step further and say that there is a lot of motion here, just in the suggestions of the shadows. The brilliant thing of it all being, of course, that there is no literal motion, yet your exposure makes this image so dynamic. While I am not sure if the greenery really takes away from the image, the length of the trail extending away is what gives me this dynamic feeling to this image, and I fear that cropping the bushes out reduces this effect. It is a very interesting area! Impactantes formaciones, donde colores, texturas, formas son poderosamente llamativas! One of the most amazing things about this place is that it is not in Montana, New Mexico or even Alberta, but just about 60K North West of Toronto. Thanks for the very good response to this one. When I read your comment and digest it, the more I realize an image like this one could very easily be in the "Patterns of Nature" project. This is even more apparent with a crop similar to your suggestion. I do have several versions of images of this area. I thought about posting a similar one to your suggestion. I just liked the one with the vegetation a little better for some reason too. It is interesting to see how crops like this can alter our perception. 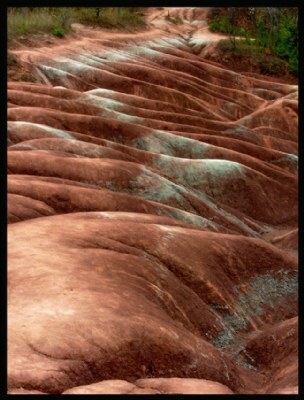 very nice capture of the badlands, great colors and forms. I stand astonished in front of the coloring and the wonderful perspectibe that reveals that the badlands are perhaps not bad at all - for photography at least! It could have been the skin of some organism, it could have been the surface of some material, it could even have been the molecular structure of something as observed through an electron mikroskop. So you reveal a very "popular" pattern in nature, and that in a way that avoids again the screams of spectacularity and allows the subject to speak for itself. I think that the coloring does much work here, as it is rich but not oversaturated! About composition, I don't know if the green at the distance is good or bad. On the one hand greenish/redish combinations are indeed very common in nature (think of plants/flowers) and the inclusion of the far lying objects does add to the three dimensionality of the image. On the other hand... imagine an only red, only badlands image. It gets purer to me. Stronger. I add a crop suggestion for that. It is flater than your image and I still like your version much more. The crop is more "abstract-like" - a question about the possibilities of making abstracts by simply capturing natural things, if you wish. Thanks for the comment and for visiting. I know what you mean about the "organic look" to the place. Maybe I could have included a shot with even more greenery in it. I have several shots with no greenery at all and the impression given from those is much more organic. The scene almost looks like a cropped image of a herd of pigs in a closed in pen. The images are still interesting without the vegetation too, just different. It is a strange place, when you can get a shot without hikers walking all over it. People can take most of the strangeness away from it, if you know what I mean. These hills almost seem organic - rather strange, but in a good way. I like this image of the badlands even more than the other one I commented on. The bit of green at the top of the image gives it some roots in reality, putting it firmly in the realm of nature - a good choice to include the greenery. Well done. Good capture of these strange formations, Andre! You've recorded great colour and details there.